IHG® Rewards Club - eBooks - ...With Reading and Writing for All! 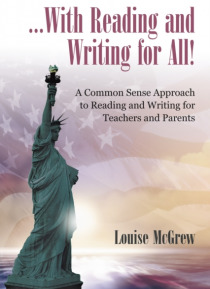 This book is a guide to the best approaches for teaching the very beginning stages of reading and writing. It also includes ways to furtherdevelop the reading and writing processes as well as some strategies for developing study skills. This book will help teachers and parentsunderstand what their childern need to become good readers. It is intended to help those who would teach reading understand… some of the basic concepts that are needed for the reading and writing process to develop along with some effective ways to teach them. One of the greatest gifts parents and teachers can give to the children entrusted to them is the love of reading along with the skills to do it well. All aspects of the teaching process is done within a very positive, encouraging, and supportive way.